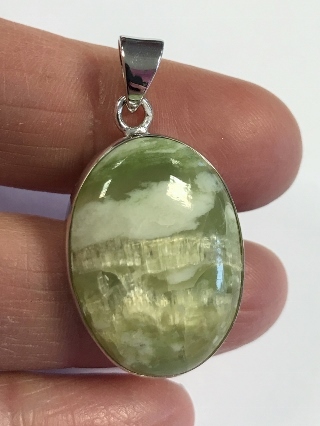 A lime toned Chrysotile pendant, set in 925 Sterling Silver. Chrysotile is a variety of Serpentine, with light-catching bands of asbestos - so it's best used in this tumbled form. Chrysotile is a stone of support, aiding recovery from long term illness and chronic fatigue, and paving the way to independence where it has been undermined or lost.